Music is good for your soul, but it’s also good for your body. It makes us move! To illustrate music’s amazing ability to stimulate movement, imagine a Parkinson’s patient who can only shuffle along with the help of a walker. Now imagine him setting that walker aside and dancing with a young woman in his arms. This is possibly with the simple addition of a music track playing in the background. It’s true, see for yourself! According to the Alzheimer’s Foundation of America, music can shift moods, help manage stress, facilitate cognitive function, and even coordinate motor movements. This is possible because music can be directly interpreted by the motor center of the brain. Now we can take that same principle and apply it to a runner or endurance athlete. Quite simply, music can make you run farther, faster, and easier if you find the right type of tunes. Scientists have discovered that music can make a huge difference in your exercise performance. A study from the University of Toronto found that music can increase the length of your workout by up to 70 percent if the tempo is correctly synced to the pace of your stride. The researchers found that participants with music felt like they weren’t exerting as much energy into their workout. Yet they were able to increase the endurance, intensity, and duration of their workouts. Best of all, this increased energy didn’t end with the workout. The effects lasted throughout the day to help the athletes be more productive and energized. The researchers are anxious to perform more studies so they can figure out what it is about auditory stimulation that makes moving easier, makes the stride longer, and makes the muscles move with more intensity. Which Kind of Runner Are You? Whether or not music will increase your treadmill performance depends on the type of athlete you are. 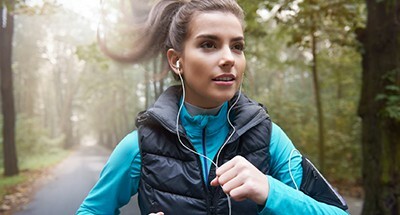 Dr. Coastas Karageoghis, author of Inside Sport Psychology, says music can increase your running performance by 15% but only if you are a certain type of runner. Associators are perfectly happy listening to the quiet beat of their footsteps while they pound away the miles. They are inwardly focused and would actively try to tune out any music that they happen to hear. Dissociators, who are more common, are going to enjoy and be energized by the music coming through their headphones. What is Your Right Type of Music to Listen to During a Run? If you are a dissociator who loves music, this doesn’t mean that just ANY music will do. You need to find a playlist that has the correct number of beats per minute (BPM) to match your stride and rhythm. This tempo is going to roughly match your heart rate while you run to help energize your steps. There are several ways to find your ideal BPM, but the easiest way is to simply count the number of steps that you take in one minute. For example, if you take around 142 steps while running for one minute, you may be energized by this Bruno Mars song. The correct BPM is going to vary with the speed of your workout, your stride length, and intensity. An article in the New York Times explained that for a power walker going at 4.5 MPH, this is usually going to be around 137 to 139 BPM. A runner is typically going to be around 147-160 BPM. Once you’ve figured out the right song tempo, you need to actually generate a playlist that you can use during your next run. There are several ways to do this. If you want to automate the process you could use analyzing software like MixMeister ($3.99) to look at all of the songs in your computer’s music library. These programs aren’t perfect and tend to get around 20-30% of the songs wrong. This might not seem like a big deal until you’re nearing the end of a tough run and Un-Break My Heart suddenly starts wailing away. Talk about a downer! Next you can try a series of apps for your smart phone available for both iPhone and Android. If you want to use the songs in your music library and sort them yourself, you can use this manual tapper tool. Finally, you can let someone else do the work for you and use a pre-generated list from a site like Running Playlist. They have playlists already created for a variety of speeds, music genres, and running distances. Most quality treadmills today have some sort of music function built into the console. Often, they will allow you to plug in your iPod or phone so the music can play directly from the treadmill speakers. 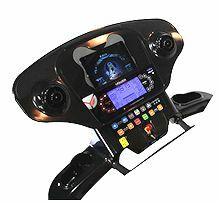 Other machines, like the Yowza Boca, have Bluetooth functions that will play your music automatically. It’s easier than ever to listen to tunes while you work out. Now you can use the right BPM playlist to kick your workout into high gear! What are you favorite songs to listen to while you work out? Do you know what your personal BPM is?